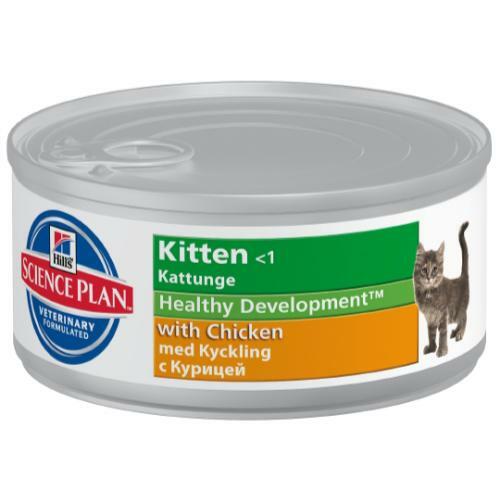 Hill's Science Plan Kitten Chicken is formulated to support immunity and digestive health, with clinically proven antioxidants and optimal levels of DHA from fish oil. Chicken (minimum Chicken 20%, Chicken and Turkey combined 30%): Pork liver, pork, chicken, soybean meal, dried whole egg, animal fat, maize gluten meal, maize starch, digest, dried beet pulp, cellulose, dicalcium phosphate, fish meal, fish oil, L-lysine hydrochloride, dried yeast, calcium carbonate, calcium sulphate, DL-methionine, taurine, potassium chloride, L-tryptophan, magnesium oxide, vitamins and trace elements. Calcium 0.0037, Carbohydrate (NFE) 0.047, Fat 0.068, Fibre (crude) 0.008, Magnesium 0.0003, Moisture 0.716, Omega-3 fatty acids 0.0027, Omega-6 fatty acids 0.0141, Phosphorus 0.0027, Potassium 0.0025, Protein 0.14, Sodium 0.0009, Taurine 1200 mg/kg, Vitamin A 19900 IU/kg, Vitamin D 375 IU/kg, Vitamin E 230 mg/kg.